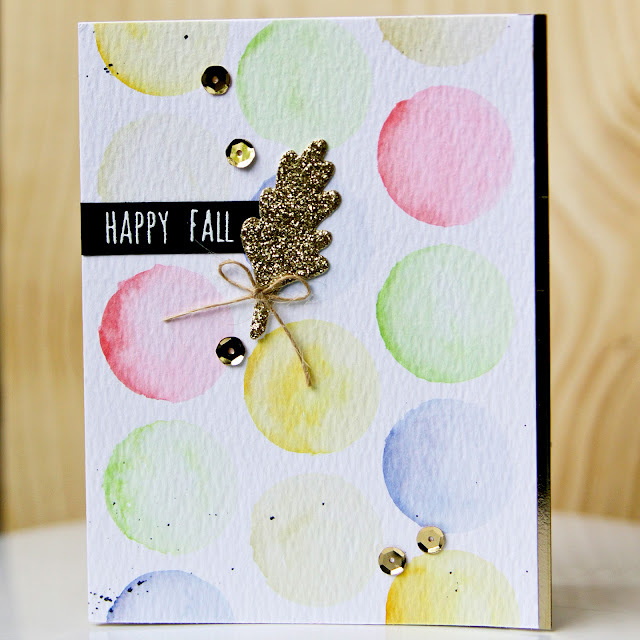 i love to watercolor and i have a big thing for dots so a card like this was bound to happen, right? 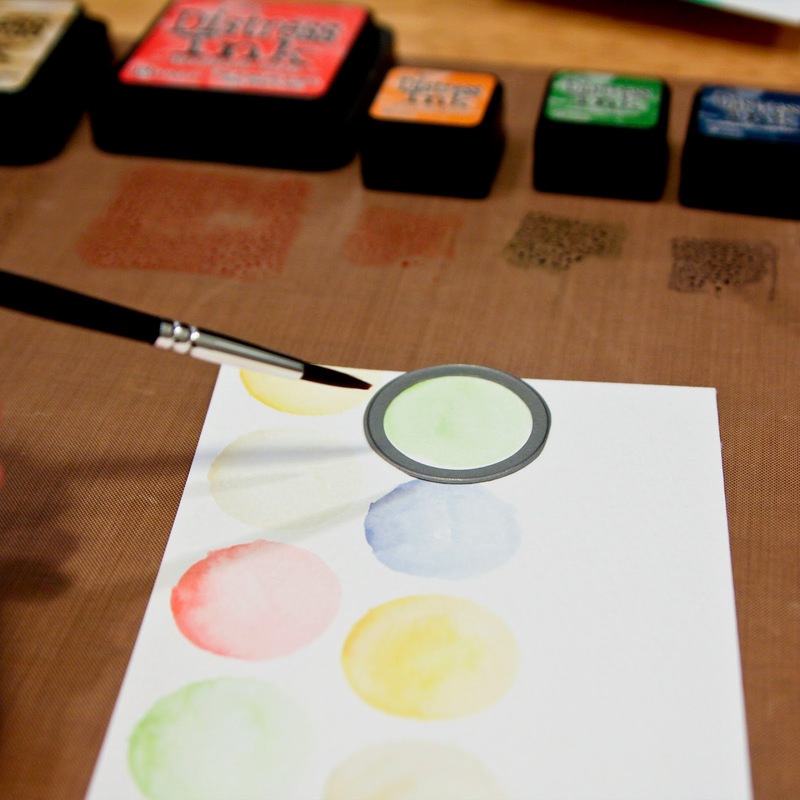 however my freehand painting skills are rubbish, so i had to come up with a way to paint perfect circles. i'll probably be practicing until i'm 90 before i can do it without help, or eventually i'll be too blind to care! haha! -i started with a 4-1/4 x 5-1/2 piece of watercolor paper and since i didn't have the right size circle stencil, i used a 1-1/4 lawn fawn circle die. i used distress inks to watercolor. -once my watercolored background was created (and i was pretty pleased with myself), i trimmed off a 1/4 from one side to center my circles. -i cut a 1/4ish x 5-1/2 piece of gold foil paper and adhered it to the edge of a solar white folded card. then i added the watercolor panel on top. -to create the message i stamped "happy fall" from the essentials by ellen autumn acorns set in white on black cardstock and embossed with white powder. i could have stamped in versamark with white powder. or i could have used clear powder with the white ink, but the white & white combo was handy on my desk and looks sharp on the black cardstock. 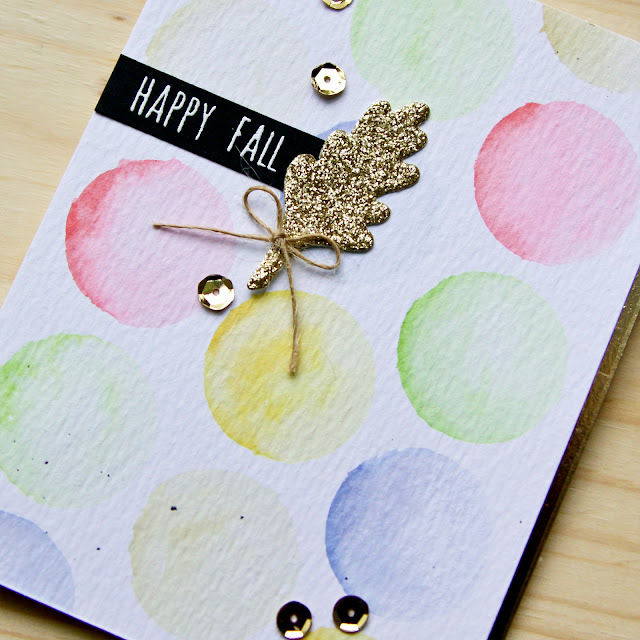 -i added a glittery leaf, die cut from gold glitter paper with the essentials by ellen thankful set; a few gold sequins; and a little black ink splatter. and finally a little twine bow!